Soccer Equipment Guide - Includes shopping deals on soccer equipment, soccer shirts, soccer kits, soccer boots as well as a variety of soccer coupons and more. Rafa Benitez has refuted rumours that he has regrets about letting Aleksandar Mitrovic joined Fulham in the summer. The Serbian excelled in his loan spell with Fulham last season and he subsequently made the switch to Craven Cottage for a fee of £27 million. He has been an instant hit with the cottagers and the new campaign has already seen him score 6 goals in just five games for Fulham and Serbia. Incredibly, Mitrovic has been able to score four goals just in the Premier League and this is more than the tally managed by the entire Newcastle team at the start of the season. Take the opportunity to support your favourite team by betting with bet365. The Magpies have been struggling big-time for offensive quality and eyebrows were raised even last season when Mitrovic did not appear to be in the plans of Benitez. The Spaniard has had to work with very little backing from the club’s board, but he says that the decision to sell Mitrovic is not one that causes him regret. Speaking to Sky Sports, Benitez said: “He is doing well, he did well for Serbia, but Rondon was doing well for Venezuela. There is no doubt that Mitrovic is a much better player than when he was at Newcastle. Back at St James’ Park, Mitrovic was only excelling in his role as a hold-up forward while he has taken his game to the next level by actively trying to create things at Fulham. His presence has helped players like Andre Schurrle shine at Fulham and the incredible work rate from the 23-year-old has also made him a fan’s favourite at Craven Cottage. At a time when regular goal scorers are incredibly hard to find in the Premier League, there are suggestions that Newcastle may be in a much better position if they had retained Mitrovic. The away draw with Cardiff City is the only point for Newcastle after four games into the campaign. After deciding to part company with Mitrovic for a massive transfer fee, Newcastle brought in the likes of Salomon Rondon and Yoshinori Muto. The former has decent Premier League experience while the latter needs to adapt to the new style as soon as possible. Even though Newcastle’s tactics are to blame for their paltry return of goals, the lack of options for Benitez is also a major factor and it is something that the Spaniard may not agree in public. The task of discovering the winning touch is made doubly difficult by a sequence of tough matches for Newcastle. The Magpies are away against the likes of Crystal Palace and Manchester United in the next five games. There may be a point where Benitez may have to ditch the defensive tactics in order to try and find more goals – without the brilliance of Mitrovic. Can an aging Bayern side keep up its dominance? The Bundesliga started with a bang on Friday, August 24th as an impressive Hoffenheim side made their way to the Allianz Arena. For Bayern Munich fans, that bang would have been the sound of backfiring and spluttering as the German champions toiled against Hoffenheim but were able to come away with a 3-1 win in the end. All things being equal, it was a scoreline that flattered the Bavarians and if it wasn’t for a rather flamboyant dive from Ribery to win a dubious penalty in the 78th minute, a draw could have well been on the cards. Amazingly, VAR didn’t intervene when Ribery was judged to be fouled in the area but it did twice afterwards as Lewandowski’s missed penalty was bundled in by Arjen Robben, only to be cancelled out as the Dutchman was seen to be in the box before the penalty was taken. Lewandowski made no mistake from the spot the second time around and Bayern went three one up after Muller deflected the ball into the goal but VAR cancelled it out for deliberate handball. Robben finally got his goal after some calamitous defending saw the Dutchman run through on goal and finish easily. It was hardly a vintage Bayern performance and even the most ardent Bavarian would admit to having seen a few cracks beginning to show. For almost ten years Bayern have had the luxury of Ribery and Robben on their wings and the duo have been virtually unplayable over that time. They share an incredible 280 assists between them and have weighed in with 256 goals from the flanks. The unprecedented success Bayern Munich has enjoyed has been largely down to the Frenchman and the Dutchman and the role they play in getting the team going forward. All good things come to an end and for one of football most iconic double acts, the end is in sight. Ribery is now 35 and Robben 34, during the season opener against Hoffenheim it was evident that their legs had gone and now are relying on their nous and passing to keep effective. There was an over-reliance on the help of the wingbacks once they had the ball to make the runs they couldn’t and this left Bayern vulnerable to any sort of counterattack Robben didn’t even start the game and was only brought on when Bayern Munich’s latest star on the wing Kingsley Coman limped off just before the break with an ankle injury. Coman will now be out for several weeks and manager Niko Kovac will have to turn to the elder statesman of the side to keep Bayern going forward with fluidity. It’s hard to say how effective Ribery and Robben will still be but Bayern should make good headway domestically and that’s backed up with the Bavarians at 1/10 to win the league in Bundesliga betting. The problem may become a bit more noticeable in the Champions League with Europe’s best defenders finally able to easily deal with the threat of Ribery and Robben. This season will be a struggle at times for Bayern and it’s unlikely that they will steamroll every team in their way like they have been doing for the past six years. There’s no doubting the fact that Bayern Munich are still the odds-on favourite to win the league but one can’t help but notice that their powers are beginning to wane. The winds of change are blowing and Kovac will be hoping it is more of a light breeze than a gust with Bayern relying on an aging side to repeat their heroics of yesteryear. As the transfer window draws nearer to its closing date, a number of clubs are pushing to sign potential players. The transfer window is closing on Thursday. The Blues are attempting to bring Arsenal’s midfielder Alex Oxlade-Chamberlain and Danny Drinkwater of Leicester this summer. Chelsea is willing to spend more than £70 million for the two premier league stars just to bring them to Stamford Bridge. Amid Chelsea’s interests, Alex Oxlade-Chamberlain refused to sign a new contract with his current club hinting out that he wants to move away from the Emirates. With less than a year on his contract, Arsenal’s manager Arsene Wenger is trying to convince him to stay at the club for few years. Alex Oxlade-Chamberlain next contract is likely to have a salary raise up to £150, 000 per week. According to Australia online pokies, the star’s market value is between £35 – 40 million and Chelsea has already agreed a fee with Arsenal and the deal is most likely to happen. Meanwhile, talks with Leicester City are intensifying ahead of the transfer window deadline. Leicester is demanding not less than £40 million for the English midfielder Danny Drinkwater. The asking price for Drinkwater is way above what Chelsea is willing to pay. Reports from Spain say that the Catalans have completed the deal of £135 million to bring Borussia Dortmund’s star Ousmane Dembele to Nou Camp. The deal is now the second most expensive transfer deal of all times. Barcelona’s new boy is the replacement for Neymar Jr who left for Paris St-Germain for a record fee of £198 million two weeks ago. The Catalans will pay an initial fee amounting to £98 million that will rise to £135 million with add-ons. Dembele signed a five-year contract with Barcelona on Monday afternoon. He is now the most expensive player for the Catalan club when it broke its own previous 2014 Suarez record fee of €80 million. Too bad real money online casino jackpots do not rise in the same way that football players rise in value. Scotland turns the game upside down in the closing moments. The man of the match for Scotland was Leigh Griffiths .He managed to score two goals for Scotland in the match that was played on the 10th of June. This was a World Cup Qualifying match for European Group F. The match was played at Hampden park .The result of the game was a surprise for the two teams. Gareth Southgate, England manager explained that the match should not have ended as a draw. He spoke about how Griffiths changed the whole game by scoring two goals. England almost lost the game. It would have been their first qualifying defeat since 2009 .The last six minutes of the match changed everything for England. England defender, Gary Cahill exclaimed that the crazy last minutes of the game were bad for them. He said that England lacked the ability to handle Griffith’s two brilliant free kicks. These free kicks got Scotland that essential one point. Before the so called “last six crazy minutes” that saw the dramatic victory for Scotland, the game was heart break match for Scotland. The free kicks left Joe Hart, who is England’s goalkeeper shocked and exposed .The once despaired and heartbroken Scotland became alive and chaotic in the last six minutes. Scotland will still need a remarkable run in the next matches. Scotland manager, Strachan praised the team. He said that his team did an extraordinary thing. There are no certainties in the world. Even when you are playing online casino games with a perfect strategy you can still lose. The beauty of online casino gaming is that you do not have to wait four years to get it right again. This match would have cemented England’s position at the top of Group F. England has to work hard to be part of next year’s finals. Can what Scotland did to England be repeated again in the next games? Every team now knows that it is possible to hold the giants. This is a clear warning to the England team. If you are a fan of sports betting, visit top online casinos in South Africa. You will be provided with sports betting and casino reviews that will give you the important information you need to know before playing. The aim is to provide online gaming community with gambling information they need for such activities. Will Celtic find a worthy challenger next year? Celtic are a dozen games into the 2016-17 SPL season and already have a 10-point lead over second-place Aberdeen with a game in hand. Things could barely be any easier for Brendan Rodgers’ side – 11 wins and one draw to start the season, scoring 35 goals and conceding only eight. They are on a seven-game winning streak since drawing at Inverness Caledonian Thistle, keeping clean sheets in their last six. One disappointment to date will be Celtic’s performances in Europe where they have only taken two points from their opening four Champions League group stages. Handing four points to Borussia Monchengladbach means the Scottish champions will need at least one victory from their final two games, versus Barcelona and Manchester City, to have a chance of qualifying for the Europa League knockout rounds in the New Year. Domestically there is no competition to the Glasgow giants this season and any competition next season may depend on summer transfer dealings from the club themselves. Right now, Celtic’s SPL betting odds for next season are incredibly short. Moussa Dembele and Scott Sinclair are obliterating the league this season but their performances are bound to attract interest from bigger clubs around Europe in the summer. The French forward signed from Fulham for only ÂŁ500k earlier this year but is currently being linked with multi-million pound moves to bigger clubs including Arsenal and Manchester United. Scott Sinclair has had several unsuccessful spells in the Premier League since leaving Swansea City where he was good in the Championship. The 27-year-old would likely be easier to keep hold of the following season.Â Sinclair also has Leigh Griffiths, James Forrest and Patrick Bamford helping out with goals – this team has goals all across the park domestically. Celtic do have areas where they can improve as proven when they compete in Europe. Goalkeeper Craig Gordon is one example whilst centre-back Kolo Toure has a mistake in him in most games. Efe Ambrose hasn’t seen too much action this season but also switches off at the back. As well as Derek McInnes is doing with Aberdeen it is very unlikely they are going to challenge Celtic for the title next season.Â The Dons have only won seven of their 13 league games to date which includes 4-1 and 1-0 defeats to Celtic and elimination from the Europa League at the hands of minnows Maribor of Slovenia. Rangers are currently third in their first season back in the SPL. A runners-up spot would be excellent for Mark Warburton’s side in attracting some bigger name players in the summer. Neither Kenny Miller or Joe Garner have proven consistent up front so far this season but Harry Forrester and Andy Halliday are chipping in goals from midfield. Even still, Celtic have the likes of Patrick Bamford and Kris Commons to call upon for goals – the runaway leaders have a lot of depth by Scotland’s standards. Celtic will have the 2016-17 SPL title wrapped up long before the final game of the season and don’t be surprised if they have an easy ride next season too. After signing up with newly promoted Premier League team AFC Bournemouth in order to become their shirt sponsor, online gaming business Mansion Group penned a similar deal with the more famous Crystal Palace Football Club as well. The London club will have the Mansion logo on their shirts for the 2015-2016 season. It will also cooperate with Mansion on several commercial avenues. The Eagles, as they are nicknamed, have finished 10th the previous season, in which they were sporting the Neteller logo on their shirts. Both sides were equally excited of the deal. Crystal Palace is an English professional football club based in South Norwood, London. They currently play in the Premier League. Their top honors are FA Cup runners up in 1990 and First Division (the former name of the Premier League) third place in 1990-1991. Mansion Group is a leading online gaming company with more than 10 years industry experience. Mansion is commited to offering the highest level of customer care with unrivalled customer support. It also rewards loyalty points to repeat players and puts security at the forefront with 128-bit encryption. Silver is used to mark a 25th wedding anniversary and Tottenham Hotspur will be hoping for some silverware this season to mark an anniversary which is slightly less of a cause for celebration. This season will make it 25 years since Tottenham’s last appearance in an FA Cup final and, given Arsenal have won the trophy seven times since then, it’s certainly about time the club were back at Wembley. True, Spurs have won the League Cup twice, and appeared in the final a further three times, since their last FA Cup final outing, but there is something about the club’s tradition in the world’s oldest cup competition. In beating Nottingham Forest in extra-time in 1991, Spurs became the first club to win the FA Cup eight times. That tally has since been surpassed by both Arsenal and Manchester United, as Spurs wait for a 10th appearance in the final. It also used to be a tradition that Spurs won the FA Cup when the year ended in one, having lifted the trophy in 1901, 1921, 1961, 1981 and 1991. But failure to reach the final in 2001 and 2011 has seen that talked about a bit less. Instead, what should be discussed is how a club of Spurs’ size have failed to make it to the FA Cup final for 25 years. The desire to qualify for the Champions League in recent seasons could be pointed to as a shifting in priorities, but Spurs’ best two finishes in the Premier League have also coincided with their best recent FA Cup runs in reaching the semi-finals. In 2010, Spurs finished fourth in the league and were beaten 2-0 by Portsmouth in the cup. Two years later, they were fourth again and lost 5-1 to Chelsea in the cup semi-final. It’s a demonstration of the momentum a cup run can bring to a club’s league form and a reason why Mauricio Pochettino should take the competition seriously this season. Spurs will enter the third round among the leading contenders in the FA Cup betting to win the competition and Pochettino has a team and a squad capable of going all the way to the final. In beating Chelsea and Arsenal at White Hart Lane in the Premier League last season, Spurs proved they are capable of matching the best teams. Even in losing 2-0 to Chelsea in the Capital One Cup Final, Spurs showed they can rise to the big occasion. With players like Harry Kane, Christian Eriksen and new signing Son Heung-min to call upon, Pochettino has the attacking talent to win a one-off cup tie. And Spurs are also usually involved in closely-contested cup finals as well, with their last four appearances all going to extra-time. In 1991, they beat Forest, after losing to Coventry 3-2 in 1987, which is the only time they’ve lost a cup final. In 1982, they beat QPR in a replay, having gone down the same route to beat Manchester City a year earlier. 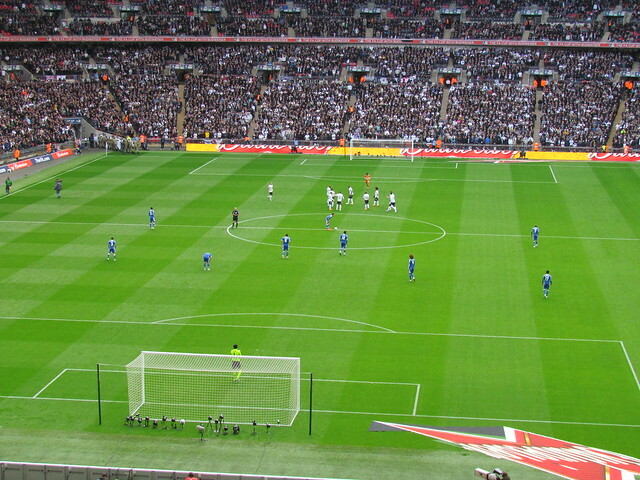 Spurs have always provided entertainment for the neutrals and the FA Cup final is the biggest game for the neutrals in the football calendar. It’s too long since Spurs played in the end-of-season showpiece and the onus must be on Pochettino to commemorate this 25th anniversary with a shiny piece of silverware. The Football Association (FA) Challenge Cup or the FA Cup, as it is known popularly, is the most prestigious and oldest domestic knock out tournament in world football. The format of the tournament has changed a bit since its was first contested during the year 1872. Every year, several teams from many leagues across England and Wales fight for the FA Cup. The only requirement for participation in the tournament is that the clubs need to be registered with the Association, playing in a well known league and having access to a stadium for home games. Teams are randomly paired for every round, and drawn games are replayed. Results of replay matches are ensured with penalty shootouts and extra-time. August is the month when the preliminary rounds for the teams in the lower leagues are drawn. Teams in English football’s higher flights automatically qualify for the next stages of the tournament, & mainly in the 3rd round are most often drawn against the lower-league-clubs. These encounters result in making the Cup odds a good collection for punters. Official competition’s rounds culminate in 2 semi-finals played at neutral-grounds to be followed by the popular FA Cup Final at Wembley at the end of May. Besides the coveted trophy & prize money, the victors get automatic entry to in next season’s Europa League. Few who’ve been watching the stars of today competing in the Cup are familiar with its humble beginnings. During the 1872, merely 2000 spectators had watched the defeat of Royal Engineers. The Wanderers had defeated them by 1-0 at the Oval. In the new century, the Cup became the much talked about one amongst people. Tens of thousands of football fans flocked to watch their football heroes do battle at Crystal Palace, Old Trafford and Stanford Bridge. By the 1950s, crowds of over 100,000 routinely attended the FA Cup Final at the Wembley Empire Stadium. As English football’s top flight is becoming more competitive year after year, teams such as Aston Villa and Arsenal are sure to do their best in trying to win this season’s trophy. Did Roy Hodgson Make a Mistake in Not Taking Terry To World Cup 2014? In the last two decades, reaching the quarter-finals was seen as something of a failure for the England national team. The World Cup 2014, however, has shown that those teams fared much better than people gave them credit for. After all, it was largely a disallowed goal that prevented England from reaching the quarter-finals of the World Cup 2010. This time, though, there is no such controversy. The players and Roy Hodgson will need to take a hard look at themselves after England suffered a second consecutive group stage defeat. The 2-1 defeat against Uruguay has not put them out of the tournament just yet, but England now need a miracle in order to reach the last 16 stage. Unsurprisingly, the latest World Cup betting odds suggest that England are 50/2 to be the top European team in this World Cup. The situation faced by England is quite a contrast to that faced by Spain. The world champions have been knocked out of the competition in the group stages after suffering two heavy defeats against Netherlands and Chile. This should not come as a major surprise despite having seen Spain dominate for the last six years. Spain failed to reinvigorate the team at just the right stage. The warning signs were there during qualification and in the Confederations Cup. Yet, Vicente del Bosque largely stuck with the same group of players and this includes strikers like Fernando Torres and David Villa. Of course, he did bring in Diego Costa, but the 25-year-old is a physical player not suited to the passing style of the Spanish team. Rather than bring in the new blood, Spain stuck with the likes of Xavi and Xabi Alonso to get them towards success as they have done in the past. Iker Casillas was also named as the first choice goalkeeper despite his failure to feature regularly for Real Madrid. In contrast, England decided to go in for youth. Roy Hodgson named a squad that contained just six players over the age of 30. The likes of Ashley Cole and Michael Carrick were surprise omissions, as the former Liverpool manager decided to go in for the youth of Luke Shaw and Ross Barkley respectively. This could have been one of the reasons for England’s failure at the World Cup 2014. The major reason, though, comes from Roy Hodgson’s stubbornness to not even consider John Terry as a possible option. Terry retired from international football after falling out with the English FA. However, there were slight indications – despite Terry’s public statements – that the 33-year-old could have been persuaded to return. Terry is a player who wears the national team colours with intense pride. In his absence, Cahill and Jagielka never looked comfortable with each other. Their indecisiveness eventually spread to the rest of the team, as they chased an equaliser against Uruguay. Despite getting the equaliser through Wayne Rooney, England remained nervous at the back. Suarez’ goal confirmed where the squad was left wanting – experience and leadership. Hodgson made a grave mistake in not taking Terry and this has ultimately proven disastrous for England.